Viezu | Jaguar XKR tuning – 5.0 super car killer! Jaguar XKR tuning – 5.0 super car killer! 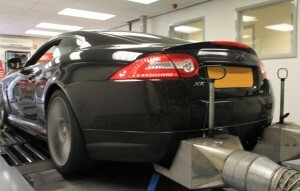 Jaguar Tuning at Viezu - Jaguar XKRS tuning – 5.0 super car killer! You would like to think if you drive an Aston Martin DBS, a Ferrari 430, or a Porsche GTrs, you are reasonably safe to look in your rear view mirror with confidence, well think again! Today we have been tuning the new Jaguar XK RS 5.0 Supercharged, a very nice car indeed and with used models already available for sub £50k, with a little tuning this Jaguar is a true super car killer in the making! Already boasting an impressive 500bhp and very sophisticated suspension and electronically controlled differential, with just a little viezu tuning the Jaguar XK can become a real a beast, running 560bhp, add a pair of racing catalytic convertors, a fine Jaguar XK performance exhaust and modified super charger pulley and you are going to be pushing 600BHP! Jaguar tuning is very popular, and the Jaguar XK reacts very well to the subtle changes to fuelling and spark advance performed by the Viezu technicians and master programmers. The same can be said of the XK’s stable mates the Jaguar XF and XJ, all versions of the Jaguar engines can be tuned, for power, performance and improved economy. With Viezu Jaguar tuning is simply and easily carried out through the OBD port, (diagnostic port) no ecu removal is needed, Viezu has dealers all over the world – please e-mail us for your local dealer and further details on our range of Jaguar tuning and performance products, as well as an extensive range of ECU remapping and performance car tuning services.